With the 4 Kiev, we start one of the bravery pieces of the Soviet Navy, symbolic of its specificity and its ability to be present on all seas, a good rival of the US Navy. 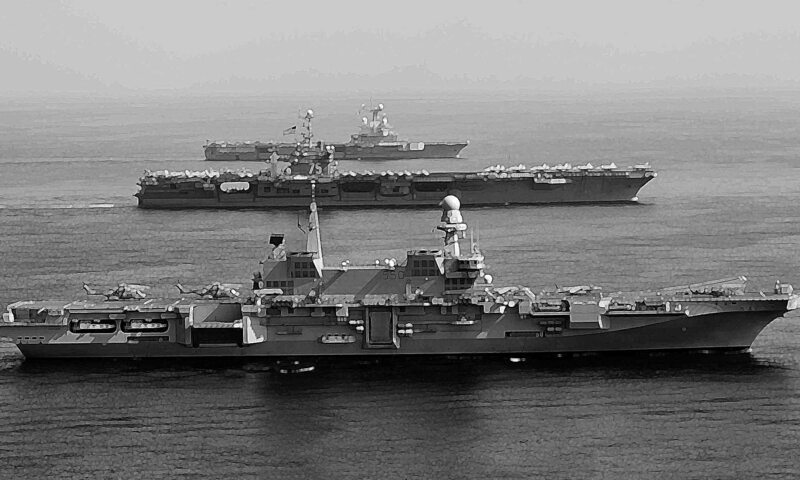 The Kiev, Minsk, Novorossiysk and Admiral Gorshkov, launched in 1972, 75, 78 and 1982, and completed in 1975, 78, 82 and 87 were defined as “guardians” of the Delta-type SNLEs, departing on mission from the bases of the Northern (Arctic) Fleet, guaranteeing the destruction of NATO ASM assets against them in case of conflict. They, like the Moskva, had to operate a number of helicopters, and also use the interceptors and their own powerful weapons to destroy allied patrol boats (Breguet Atlantic Type, Lockheed P3 Orion, or Bae Nimrod). Unlike American aircraft carriers, these Soviet ships are not pure cruisers, nor are they authentic aircraft carriers, but hybrids. 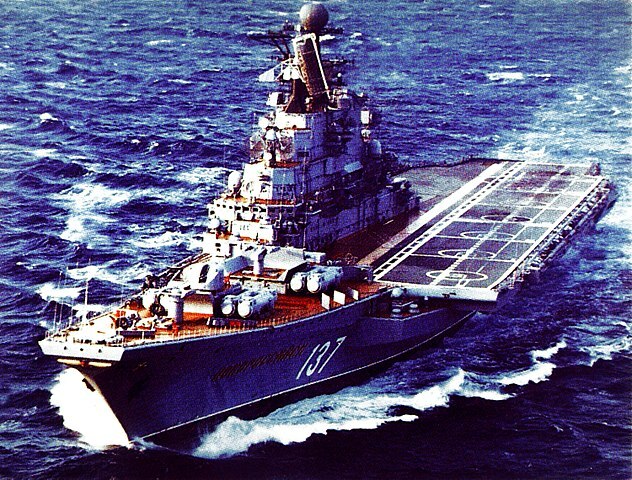 Aircraft require, their flight deck is differentiated from the Moskva by being lateral, the superstructure spreading along its length. The entire front of the hull, on the other hand, is that of a cruiser, with a complete panoply to meet all needs: long-range antiswile missiles, medium and short range antiaircraft, torpedo tubes, AA and AM guns, and 3 rocket launchers ASM, with 31 additional devices including 12 Yak and 18/19 Kamov “Hormone”. The latter can deploy light anti-ship missiles and tactical nuclear ASM grenades against ANS. These impressive buildings, however, were handicapped by too low a load of poor quality interceptors. The Yak-38 “Forger” (NATO code), were in the opinion of all the experts, and the Soviets themselves (the pilots among others), the pale copies of the British Harriers, devoid of surface radar, slow, unmanageable, with a very limited load bearing, low range, and controllable nozzle operation controversial: There were probably accidents never officially revealed, but the “Forger” quickly gained a reputation for flying dangerous. In 1991, the two remaining in service were simply scrapped. Their replacements, the Yak-141 “Freehand”, supersonic and with better characteristics were then phase of tests when the Soviet Union knew its budgetary cuts budget. The Yak 141 was never operational and sank into oblivion. The 4 Kiev were still in service in 1992, but both of the Pacific Fleet have been stranded since their respective propeller accidents in 1994 due to lack of funds for repairs, and both of the Northern Fleet suffered a small fate. enviable: In order to keep the Gorshkov in service, we cannibalisa Kiev, docked now, disarmed and serving as a reserve of parts. The Gorshkov is currently the only one active, but often at dockside for lack of funds for its maintenance. When in Kiev, its general state is closer to that of a wreck. The current Russian navy has given priority to Tbilisi. Propulsion: 4 propellers, 4 turbines VHP, 140 000 cv. et 32 knots max. Electronics: Radars 2 Palm Front, Top Sail, Top steer, 2 Head Light, 2 Pop group, 2 Owl Screech, 2 bass Tilt, 1 Trap Door. 1 Sonar de proue, 1 SPV, 8 CME Side Globes, 12 Bell, 4 Rum Tub, 2×2 Lance leurres. Armament: 4×2 SSN14 (24), 2×2 SAN3 72), 2×2 SAN4 (40), 4 x 76 mm (2×2), 8 x30 mm Gatling, 10 x 533 mm TTs (2×5), 1×2 LR SUW1, 2 RBU 6000 (2×12), 12 Yak-38, 19 helicopters ASM Kamov Ka-25B/C “Hormone”.